But you wouldn’t know it if you had a conversation with the one-time native of West Suburban Downers Grove. During an appearance at STARRCAST on Aug. 31, 2018, Poffo, 64, spoke as astutely and authoritatively as he did when he was active in WWE in the late 1980s and early 1990s. Poffo, a 1973 graduate of Downers Grove North High School, was part of a legendary wrestling family. His father was Angelo Poffo, and his older brother, Randy (better known as “Macho Man” Randy Savage) is one of the greatest of all time. The Poffo brothers were baseball players with the Mustangs with Randy even playing minor league ball before breaking into the family profession. Angelo ran the ICW territory based in Lexington, Ky. in the late 1970s and early 1980s and both of his sons worked for him before they worked for Jerry “The King” Lawler in Memphis. Lanny often was in the shadow of Randy’s larger-than-life personality. “He was the alpha male, I was the beta,” Poffo said. Poffo entered WWE in 1985 as was often utilized as enhancement talent. When he first entered the company, he was known as “Leaping Lanny,” a white-meat babyface who would recite poems before his matches, some of which would rile up his opponent, and then toss Frisbees with said poem printed on them out into the audience. He employed a mix of ground-based offense with high-flying maneuvers that were ahead of their time. While Randy would ascend to heights as WWE Intercontinental Champion, including his memorable WrestleMania 3 bout with Ricky “The Dragon” Steamboat, and WWE Champion after winning a tournament at WrestleMania 4, Lanny’s true break finally came in 1989 – as a heel. Poffo was christened the Genius, complete with cap and gown as part of his entrance gear. He still would recite his pre-match poem but his words would be full of disdain toward his opponent. He tweaked his in-ring style to include dirty tactics. Eventually, Poffo became the manager of “Mr. Perfect” Curt Hennig as part of a memorable rivalry with then-WWE Champion Hulk Hogan. With Hennig by his side, Poffo even defeated the Hulkster by countout on an episode of Saturday Night’s Main Event, WWE’s nationally-televised show on NBC which occasionally preempted Saturday Night Live. Poffo traveled the country wrestling against Hogan for several months. Poffo relocated to the Tampa area during his wrestling career, but the Chicago area is never too far from his heart. He also reemphasized his love for Chicago’s baseball teams. Both Randy and Lanny were gone from WWE by the end of 1994. Randy went to WCW and enjoyed a few years in the spotlight while Lanny disappeared from the limelight. For many years following his retirement, Randy was one of the biggest omissions from the WWE Hall of Fame. The Poffos were a tight-knit family and for a long time Randy insisted that the Poffos should be inducted into the Hall of Fame together, including Angelo and Lanny. Randy tragically died in 2011 when he was involved in an auto accident following a cardiac episode and didn’t live to see an induction. Then a few years later, the door reopened for wrestling fans who desperately wanted to see the beloved “Macho Man” enshrined. WWE announced in January 2015 that Randy would finally take his rightful place in the WWE Hall of Fame. Randy’s on-again, off-again friend and rival Hulk Hogan inducted him while Lanny recited the acceptance speech. It then appeared that Lanny’s involvement in professional wrestling would be limited to the occasional conventions, but Jay Lethal changed all that. Lethal, who performed a spot-on impression of the “Macho Man” during his run with IMPACT Wrestling several years ago, decided to bring back his “Black Machismo” gimmick for the ALL IN event last September. He helped bring in Lanny to ALL IN weekend and to STARRCAST, where they shared a table at the convention and hawked their merchandise together, including a “Brothers from Another Mother” T-shirt with Lethal and Poffo together. Poffo accompanied Lethal to the ring for his ALL IN match ROH World Championship title defense against Flip Gordon. Poffo even was the receiving end of a low-blow from Bully Ray, who interfered in the match. But once Chicago favorite Colt Cabana came out for the save, Poffo and Lethal were able to celebrate Lethal’s successful title defense. In September, Poffo joined the podcasting universe with “The Genius Cast,” in which he shared stories of his career and interactions with other wrestlers with co-host and fellow Chicago-area native J.P. Zarka of ProWrestlingStories.com. The final episode of the podcast’s near-five-month run dropped this week and it features a tribute to “Rowdy” Roddy Piper. It’s been a fruitful career for Poffo with many experiences. He cites Outback Jack, Ricky “The Dragon” Steamboat, Rick Martel and Tito Santana as peers with which he remains in contact. With ALL IN and “The Genius Cast” in the rear-view mirror, Poffo still wants to stay close to the wrestling business in some way. Lanny Poffo, from a Windy City Wrestling program for “Battle of the Belts 2” from a May 1991 show at the Chicago Amphitheatre. 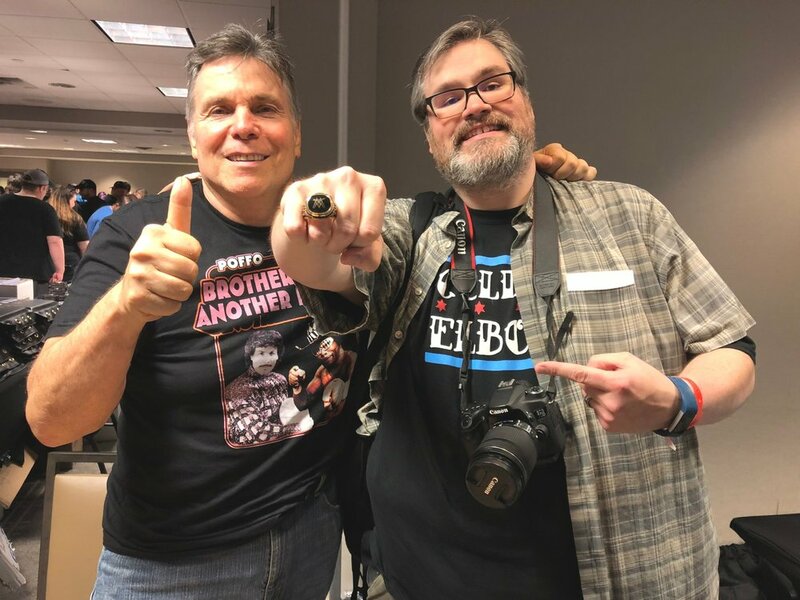 Lanny Poffo, left, with Windy City Slam editor Mike Pankow (wearing Randy Savage’s WWE Hall of Fame ring) during STARRCAST at the Hyatt Regency Schaumburg on Friday, Aug. 31, 2018. Aug 2 Welcome to Windy City Slam!